It should be such a beautiful place. A world populated by humans, huge dragons and callistons. Where the species complement each other, rely on each other, in the same way as two plants will only flourish if both are in the garden. But it isn't. The people of Dirt are poor, distrustful and look out for only their own. There are huge divisions between human and dragons and they are turning their backs on one other. To survive, it must change. Johnson Farthing is a poor nineteen-year-old in a dusty coastal town. When his sister, a maid, and the daughter of the ruler are kidnapped by slavers, he chases across the world of Dirt with the help of a beautiful Sea Dragon called Fren-Eirol and a strange magician with an unusual drink problem. So begins the saga of Dirt. 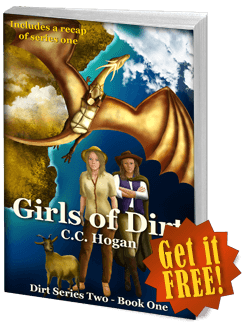 A saga about ordinary people and of the beautiful dragons that should be their friends. A saga that that tells of war, love, friendship and the fight for freedom and equality. This is a tale of real people, both human and dragon, who laugh and cry, are silly and are brave, and will do anything for their friends. It is a story of love and hope that spans the continents and the centuries. Start reading series one now for free! It is five hundred years later, and the distant descendant of Johnson Farthing is a young girl escaping her abusive family on the beautiful Isle of Hope. Silvi Farthing has a small goat herd, a tiny cottage on the rocky shore, a shed full of cheeses and the beginnings of her own little business. She may have no coin, but the seventeen-year-old is clever, optimistic, and loving her little adventure. But when her misogynistic brothers destroy her dream and nearly kill her, she is afraid the huge creature that comes to her rescue might be worse! Start series two with Girls of Dirt. Includes a recap of series one! 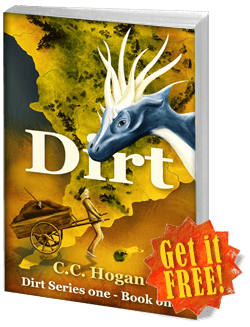 If you have an established Book Review Website, and you wish to review Dirt, please contact me via my blog. "Driven by amazing characters, this is definitely an epic fantasy in the making. Sit back, relax and travel to the world called Dirt. Well-written, fabulous dialogue, inspiring and creatively mesmerizing, C.C. 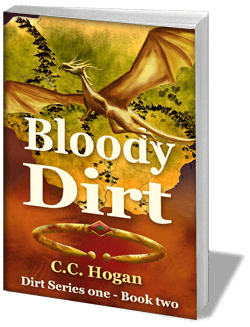 Hogan is creating a strong platform for more in this epic series." Series Two is out now! Read Girls of Dirt, now! The Abbey is a resource of everything to do with the world of Dirt. Character written, it is based on the huge amount of notes I have made when writing the stories. There are lists of characters, articles about dragons, maps, histories, all kinds of things. And there is much more I have yet to add. Visit The Abbey and learn about this beautiful world. In ancient history, dragons would often carry humans, but only in one culture was it common for a dragon to take a person as a rider; Ponack. Dragons have to learn to fly and although they find the process perfectly natural, it is not something we can do straight out of the nest. It is an adventure and this is just one story from my early experiences. The life of Fren-Eirol may have taken on legendary status in her later life, but when young, her life was very ordinary, though interesting to those who do not understand the dragon peoples. Mistry Jinx is one of the main characters in the Dirt fantasy books. In this article, she tells us of her life in her own words. Magicians on Dirt are often treated as cheats and charlatans, and often rightly, but those that do have skills are often a puzzle. A discussion about magic and how it relates to the people of Dirt. Does it exist? "We walk out, Farthing, nice and slow, like they are not here. On my cue we run." "What will the cue be?" "I ain’t that little kid who ran away from the circus with you anymore, mate!" "She has found that thin line between hero and stupid and loves crossing it. Very proud of her. Definitely adopt her one day just to piss her off." "You know, adventures are not always as fun as they sound in the stories," Weasel said as they walked up the sands. "There are all the boring bits to start with." Set during the events of Series One, Yona is a stand alone short story telling the tale of Yona, a slave, and her escape across Dirt with an incredible, huge, Calliston. A beautiful, gentle story with songs, laughter and true friendship. Read More.